energyOrbit provides a unified, cloud-based platform that enables today’s leading utilities and third-party implementers to realize an average of 65-75% in improved efficiency and operational savings in their DSM operations. Here's how five of North America's investor owned utilities and dozens of municipal utilities and cooperatives and other partners are utilizing the energyOrbit platform to increase customer engagement and help families and businesses save energy. Eight of the Nation's Top Utilities and Three of the Leading 3rd-Party Implementers Have Standardized on energyOrbit. 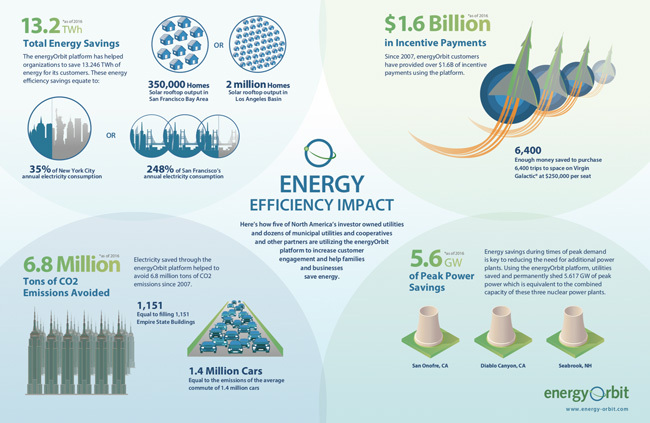 We are always seeking ways to build on the success of our energy efficiency programs to meet our goal of helping even more customers save energy and money from our incentives. energyOrbit provides a strong and flexible technical foundation that facilitates a more effective and efficient management of our portfolio. energyOrbit had demonstrated the power, ease of integration and flexibility to handle the needs of a large public utility. We are pleased with the power of the solution and responsiveness of the energyOrbit team. is a cloud based solution provisioned on the Salesforce cloud platform.